We are very saddened to share the news that His Eminence Choden Rinpoche passed away on September 11, 2015, at 1:30am India time at Sera Je Monastery in South India. Choden Rinpoche was a highly respected Buddhist master and a much loved teacher, who taught at many FPMT centers over the years. Sera Jey Monastery kindly requests all concerned organizations, Dharma centers and individuals to commence continuous recitation of Chanting the names of Manjushri and the three dedication prayers of Guhyasamaja, Heruka and Yamantaka, as much as possible in accordance with the stages of prayer for the passing of a great lama. May Rinpoche return swiftly to continue to teach us! Additional information can be found at the FPMT site. 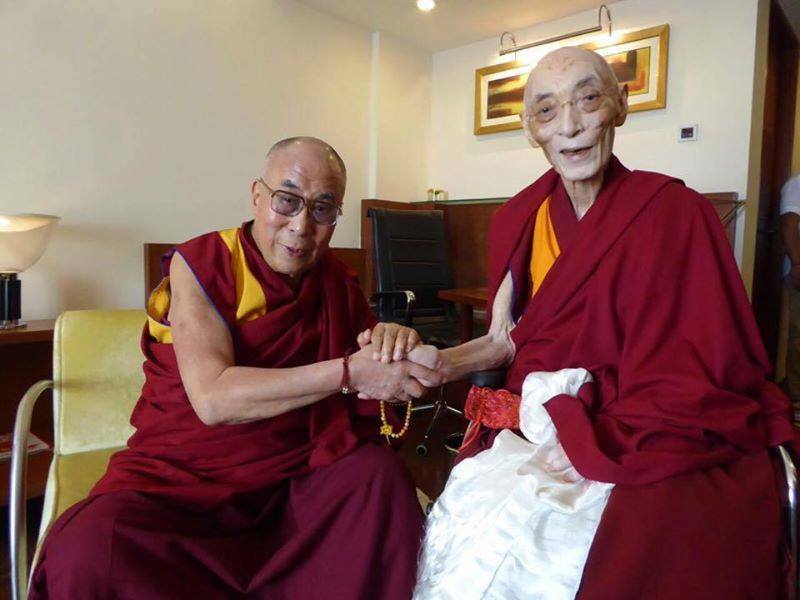 His Holiness the Dalai Lama and His Eminence Choden Rinpoche, New Delhi, India, August 29, 2015. Photo courtesy of Sera Je Monastery.